The Luftwaffe [N 2] (German pronunciation: [ˈlʊftvafə] ( listen )) was the aerial warfare branch of the combined German Wehrmacht military forces during World War II. Germany's military air arms during World War I, the Luftstreitkräfte of the Army and the Marine-Fliegerabteilung of the Navy, had been disbanded in May 1920 as a result of the terms of the Treaty of Versailles which stated that Germany was forbidden to have any air force. During the interwar period, German pilots were trained secretly in violation of the treaty at Lipetsk Air Base. With the rise of the Nazi Party and the repudiation of the Versailles Treaty, the Luftwaffe was officially established on 26 February 1935, just over a fortnight before open defiance of the Versailles Treaty through German re-armament and conscription would be announced on March 16. The Condor Legion, a Luftwaffe detachment sent to aid Nationalist forces in the Spanish Civil War, provided the force with a valuable testing ground for new tactics and aircraft. Partially as a result of this combat experience, the Luftwaffe had become one of the most sophisticated, technologically advanced, and battle-experienced air forces in the world when World War II broke out in 1939. By the summer of 1939, the Luftwaffe had twenty-eight Geschwader (wings). The Luftwaffe also operated Fallschirmjäger paratrooper units. The Condor Legion was a unit composed of military personnel from the air force and army of Nazi Germany, which served with the Nationalists during the Spanish Civil War of July 1936 to March 1939. The Condor Legion developed methods of strategic bombing which were used widely in the Second World War shortly afterwards. The bombing of Guernica was the most infamous operation carried out by the Condor Legion. Hugo Sperrle commanded the unit's aircraft formations and Wilhelm Ritter von Thoma commanded the ground element. After the defeat of Germany, the Luftwaffe was disbanded in 1946. During World War II, German pilots claimed roughly 70,000 aerial victories, while over 75,000 Luftwaffe aircraft were destroyed or significantly damaged. Of these, nearly 40,000 were lost entirely. The Luftwaffe had only two commanders-in-chief throughout its history: Hermann Göring and later Generalfeldmarschall Robert Ritter von Greim for the last two weeks of the war. The Luftwaffe was deeply involved in Nazi war crimes. By the end of the war, a significant percentage of aircraft production originated in concentration camps, an industry employing tens of thousands of prisoners. [N 3] The Luftwaffe's demand for labor was one of the factors that led to the deportation and murder of hundreds of thousands of Hungarian Jews in 1944. 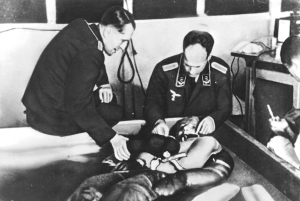 The Luftwaffe High Command organized Nazi human experimentation, and Luftwaffe ground troops committed massacres in Italy, Greece, and Poland. Hermann Wilhelm Göring was a German political and military leader as well as one of the most powerful figures in the Nazi Party (NSDAP) that ruled Germany from 1933 to 1945. A veteran World War I fighter pilot ace, he was a recipient of the Pour le Mérite. He was the last commander of Jagdgeschwader 1, the fighter wing once led by Manfred von Richthofen. Robert Ritter von Greim was a German Field Marshal and pilot. In the last days of World War II, Adolf Hitler appointed Greim as commander of the Luftwaffe in place of Hermann Göring, whom he had dismissed for treason. When Germany surrendered, Greim was taken prisoner by American forces; he committed suicide in prison on 24 May 1945. The Imperial German Army Air Service was founded in 1910 with the name Die Fliegertruppen des deutschen Kaiserreiches, most often shortened to Fliegertruppe. It was renamed Luftstreitkräfte on 8 October 1916. The air war on the Western Front received the most attention in the annals of the earliest accounts of military aviation, since it produced aces such as Manfred von Richthofen and Ernst Udet, Oswald Boelcke, and Max Immelmann. After the defeat of Germany, the service was dissolved on 8 May 1920 under the conditions of the Treaty of Versailles, which also mandated the destruction of all German military aircraft. The Deutsche Luftstreitkräfte —known before October 1916 as the Fliegertruppen des deutschen Kaiserreiches or simply Die Fliegertruppe—was the World War I (1914–18) air arm of the German Army, of which it remained an integral part. 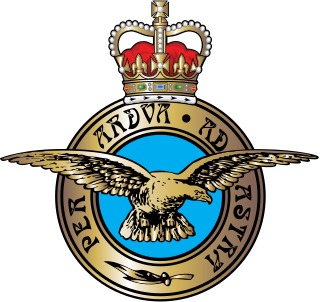 In English-language sources it is usually referred to as the Imperial German Air Service, although that is not a literal translation of either name. German naval aviators serving with the Marine-Fliegerabteilung remained an integral part of the Imperial German Navy. Both military branches, the army and navy, operated conventional aircraft, observation balloons and Zeppelins. Manfred Albrecht Freiherr von Richthofen, also known as the "Red Baron", was a fighter pilot with the German Air Force during World War I. He is considered the ace-of-aces of the war, being officially credited with 80 air combat victories. Ernst Udet was a German pilot and air force general during both World War I and World War II. 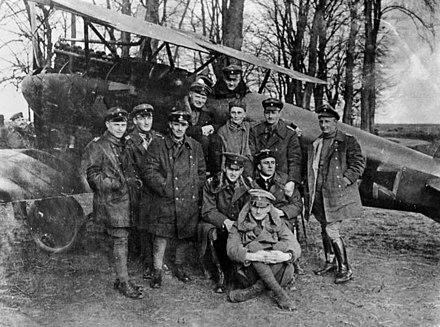 Since the Treaty of Versailles forbade Germany to have an air force, German pilots trained in secret. Initially, civil aviation schools within Germany were used, yet only light trainers could be used in order to maintain the façade that the trainees were going to fly with civil airlines such as Deutsche Luft Hansa. To train its pilots on the latest combat aircraft, Germany solicited the help of the Soviet Union, which was also isolated in Europe. A secret training airfield was established at Lipetsk in 1924 and operated for approximately nine years using mostly Dutch and Soviet, but also some German, training aircraft before being closed in 1933. This base was officially known as 4th squadron of the 40th wing of the Red Army. Hundreds of Luftwaffe pilots and technical personnel visited, studied and were trained at Soviet air force schools in several locations in Central Russia. Roessing, Blume, Fosse, Teetsemann, Heini, Makratzki, Blumendaat, and many other future Luftwaffe aces were trained in Russia in joint Russian-German schools that were set up under the patronage of Ernst August Köstring. Ernst-August Köstring was a German diplomat and officer who served in World War II. Throughout the history of Nazi Germany, the Luftwaffe had only two commanders-in-chief. The first was Hermann Göring, with the second and last being Generalfeldmarschall Robert Ritter von Greim. His appointment as commander-in-chief of the Luftwaffe was concomitant with his promotion to Generalfeldmarschall , the last German officer in World War II to be promoted to the highest rank. Other officers promoted to the second highest military rank in Germany were Albert Kesselring, Hugo Sperrle, Erhard Milch, and Wolfram von Richthofen. 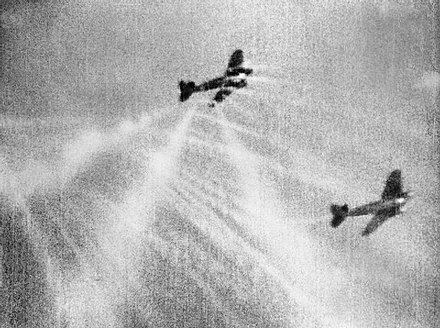 During the Battle of Britain in summer 1940, the Luftwaffe inflicted severe damage to the Royal Air Force, but did not achieve the air superiority that Hitler demanded for the proposed invasion of Britain, which was postponed and then cancelled in December 1940. 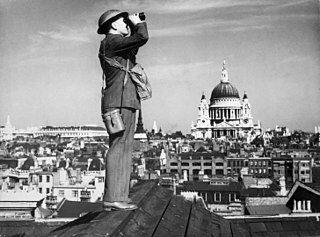 The Luftwaffe ravaged British cities during The Blitz, but failed to break British morale. Hitler had already ordered preparations to be made for Operation Barbarossa, the invasion of the Soviet Union. In June 1941, Germany invaded the Soviet Union. 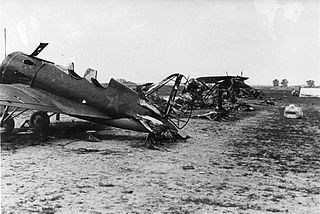 The Luftwaffe destroyed thousands of Soviet aircraft, yet it failed to destroy the Red Air Force altogether. Lacking strategic bombers (the very "Ural bombers" that General Wever had asked for six years before) the Luftwaffe could not strike at Soviet production centers regularly or with the needed force. As the war dragged on, the Luftwaffe was eroded in strength. The defeats at the Battle of Stalingrad and Battle of Kursk ensured the gradual decline of the Wehrmacht on the Eastern Front. German day and night fighter pilots claimed more than 70,000 aerial victories during World War II. Of these, about 745 victories are estimated to be achieved by jet fighters. Flak shot down 25,000–30,000 Allied planes. Broken down on the different Allies, about 25,000 were American planes,  about 20,000 British, 46,100 Soviet,  1,274 French,  375 Polish,  and 81 Dutch as well as aircraft from other Allied nationalities. The highest scoring day fighter pilot was Erich Hartmann with 352 confirmed kills, all of them at the Eastern front against the Soviets. The leading aces in the west were Hans-Joachim Marseille with 158 kills against planes from the British Empire (RAF, RAAF, and SAAF) and Georg-Peter Eder with 56 kills of aircraft from the USAAF (of a total of 78). The most successful night fighter pilot was Heinz-Wolfgang Schnaufer, who is credited with 121 kills. 103 German fighter pilots shot down more than 100 enemy aircraft for a total of roughly 15,400 aerial victories. Roughly a further 360 pilots claimed between 40 and 100 aerial victories for round about 21,000 victories. Another 500 fighter pilots claimed between 20 and 40 victories for a total of 15,000 victories. It is relatively certain that 2,500 German fighter pilots attained ace status, having achieved at least five aerial victories. These achievements were honored with 453 German single and twin-engine (Messerschmitt Bf 110) day fighter pilots having received the Knight's Cross of the Iron Cross. 85 night fighter pilots, including 14 crew members, were awarded the Knight's Cross of the Iron Cross. Some Bomber pilots were also highly successful. The Stuka and "Schlachtflieger" pilot Hans-Ulrich Rudel flew 2,530 ground-attack missions and claimed the destruction of more than 519 tanks and a battleship, among others. He was the most highly decorated German serviceman of the Second World War. The Bomber pilot Hansgeorg Bätcher flew more than 658 combat missions destroying numerous ships and other targets. 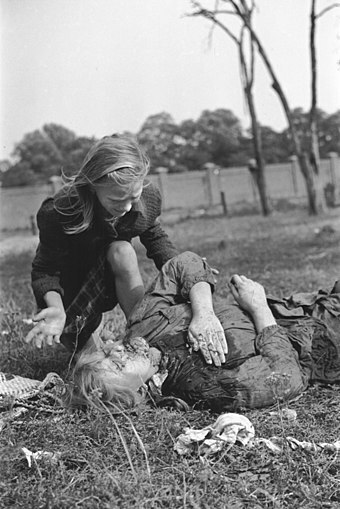 The failure of German production was evident from the start of the Battle of Britain. By the end of 1940 the Luftwaffe had suffered heavy losses and needed to regroup. Deliveries of new aircraft were insufficient to meet the drain on resources; the Luftwaffe, unlike the RAF, was failing to expand its pilot and aircraft numbers. This was partly owing to production planning failures before the war and the demands of the army. Nevertheless, the German aircraft industry was being outproduced in 1940. In terms of fighter aircraft production, the British exceeded their production plans by 43%, while the Germans remained 40% "behind" target by the summer 1940. In fact German production in fighters fell from 227 to 177 per month between July and September 1940. One of the many reasons for the failure of the Luftwaffe in 1940 was that it did not have the operational and material means to destroy the British aircraft industry,  something that the much-anticipated Bomber B design competition was intended to address. BMW worked on what was essentially an enlarged version of its highly successful BMW 801 design from the Focke-Wulf Fw 190A. This led to the 53.7-litre displacement BMW 802 in 1943, an eighteen-cylinder air-cooled radial, which nearly matched the American Duplex-Cyclone's 54.9-litre figure, and the even larger, 83.5-litre displacement BMW 803 28-cylinder liquid-cooled radial, which from post-war statements from BMW development personnel were each considered to be "secondary priority" development programs at best. This situation with the 802 and 803 designs led to the company's engineering personnel being redirected to place all efforts on improving the 801 to develop it to its full potential. The BMW 801F radial development, through its use of features coming from the 801E subtype, was able to substantially exceed the over-1,500 kW output level. The two closest Allied equivalents to the 801 in configuration and displacement – the American Wright Twin Cyclone, and the Soviet Shvetsov ASh-82 radials – never had any need to be developed beyond a 1,500 kW output level, as larger-displacement, 18-cylinder radial aviation engines in both nations (the aforementioned American Double Wasp and Duplex-Cyclone) and the eventual 1945 premiere of the Soviet Shvetsov ASh-73 design, all three of which started their development before 1940, handled needs for even greater power from large radial aviation engines. Only the twinned-up Daimler-Benz DB 601-based, 1,750 kW output designated the DB 606, and its more powerful descendant, the 2,130 kW output DB 605-based DB 610, each of some 1.5 tonnes weight apiece, were the only 1,500 kW-plus output level aircraft powerplants to ever be produced by Germany for its front-line Luftwaffe combat aircraft, mostly for the powerplants of the aforementioned Heinkel He 177A heavy bomber. 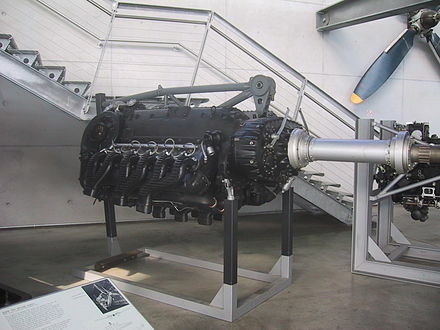 Even the largest-displacement inverted V12 aircraft powerplant built in Germany, the 44.52-litre (2,717 cu. in.) Daimler-Benz DB 603, which saw widespread use in twin-engined designs, could not exceed the 1,500 kW output level without more development. By March 1940, even the DB 603 was being "twinned-up"  as the 601/606 and 605/610 had been, to become their replacement "power system": this was the strictly experimental, approximately 1.8-tonne weight apiece, twin-crankcase DB 613; capable of over 2,570 kW (3,495 PS) output, but which never left its test phase. The proposed over-1,500 kW output subtypes of German aviation industry's existing piston aviation engine designs—which adhered to using just a single crankcase that were able to substantially exceed the aforementioned over-1,500 kW output level—were the DB 603 LM (1,800 kW at take-off, in production), the DB 603 N (2,205 kW at take-off, planned for 1946) and the BMW 801F (1,765 kW (2,400 PS) engines. The pioneering nature of jet engine technology in the 1940s resulted in numerous development problems for both of Germany's major jet engine designs to see mass production, the Jumo 004 and BMW 003 (both of pioneering axial flow design), with the more powerful Heinkel HeS 011 never leaving the test phase, as only 19 examples of the HeS 011 would ever be built for development. Even with such dismal degrees of success for such advanced aviation powerplant designs, more and more design proposals for new German combat aircraft in the 1943–45 period centered either around the failed Jumo 222 or HeS 011 aviation powerplants for their propulsion. Luftwaffe paratroopers committed many war crimes in Crete following the Battle of Crete, including the Alikianos executions,  Massacre of Kondomari,  and the Razing of Kandanos. Several Luftwaffe divisions, including the 1st Parachute Division,  2nd Parachute Division,  4th Parachute Division,  19th Luftwaffe Field Division,  20th Luftwaffe Field Division  and the 1st Fallschirm-Panzer Division,  committed war crimes in Italy, murdering hundreds of civilians. 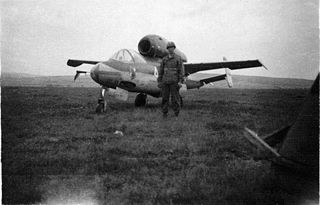 The Heinkel He 162 Volksjäger, the name of a project of the Emergency Fighter Program design competition, was a German single-engine, jet-powered fighter aircraft fielded by the Luftwaffe in World War II. It was designed and built quickly and made primarily of wood as metals were in very short supply and prioritised for other aircraft. Volksjäger was the Reich Air Ministry's official name for the government design program competition won by the He 162 design. Other names given to the plane include Salamander, which was the codename of its construction program, and Spatz ("Sparrow"), which was the name given to the plane by Heinkel. The Heinkel He 111 was a German aircraft designed by Siegfried and Walter Günter at Heinkel Flugzeugwerke in 1934. Through development it was described as a "wolf in sheep's clothing". Due to restrictions placed on Germany after the First World War prohibiting bombers, it masqueraded as a civil airliner, although from conception the design was intended to provide the nascent Luftwaffe with a fast medium bomber. The Focke-Wulf Ta 154 Moskito was a fast twin-engined German night fighter aircraft designed by Kurt Tank and produced by Focke-Wulf during late World War II. Only a few were produced, proving to have less impressive performance than the prototypes. The Messerschmitt Bf 110, often known unofficially as the Me 110, is a twin-engine heavy fighter and fighter-bomber developed in Nazi Germany in the 1930s and used by the Luftwaffe during World War II. Hermann Göring was a proponent of the Bf 110. It was armed with two MG FF 20 mm cannon, four 7.92 mm MG 17 machine guns, and one 7.92 mm MG 15 machine gun or twin-barrel MG 81Z for defence. Development work on an improved type to replace the Bf 110, the Messerschmitt Me 210 began before the war started, but its teething troubles from its aerodynamics resulted in the Bf 110 soldiering on until the end of the war in various roles, alongside its replacements, the Me 210 and the significantly improved Me 410 Hornisse. 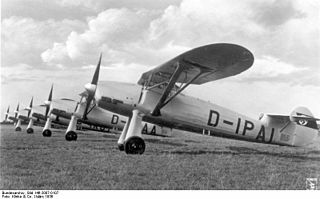 The Heinkel He 51 was a German single-seat biplane which was produced in a number of different versions. It was initially developed as a fighter, a seaplane variant and a ground-attack version were also developed. It was a development of the earlier He 49. 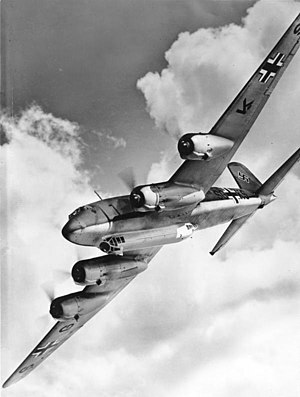 The Heinkel He 277 was a four-engine, long-range heavy bomber design, originating as a derivative of the He 177, intended for production and use by the German Luftwaffe during World War II. The main difference was in its engines. Rather than using two fire-prone Daimler-Benz DB 606 "power system" engines, each of which consisted of side-by-side paired Daimler-Benz DB 601s and with each DB 606 "power system" weighing 1.5 tonnes apiece — or two of the similar DB 610, each of which used a pair of DB 605 engines in a similar "twinned" configuration on later He 177A airframes, the He 277 was intended to use four unitized BMW 801E 14-cylinder radial engines, each mounted in an individual nacelle and each turning a three-blade, four-meter diameter propeller. Wolfram "Ulf" Karl Ludwig Moritz Hermann Freiherr von Richthofen was a German field marshal of the Luftwaffe during World War II. Born in 1895 into a family of the Prussian nobility, Richthofen grew up in prosperous surroundings. At the age of eighteen, after leaving school, he opted to join the German Army rather than choose an academic career, and joined the army's cavalry arm in 1913. The Heinkel He 118 was a prototype German monoplane dive bomber design that lost out to the Junkers Ju 87 Stuka in the 1930s, and was never ordered by the Luftwaffe. The Emergency Fighter Program was the program that resulted from a decision taken on July 3, 1944 by the Luftwaffe regarding the German aircraft manufacturing companies during the last year of the Third Reich. The Ural bomber was the initial aircraft design program/competition to develop a long-range bomber for the Luftwaffe, created and led by General Walther Wever in the early 1930s. Wever died in an air crash on June 3, 1936, and the program ended almost immediately. Albert Kesselring took over his position in the Luftwaffe, abandoning most of his designs and turning others into tactical bombers. The Messerschmitt Me 261Adolfine was a long-range reconnaissance aircraft designed in the late 1930s. It looked like an enlarged version of the Messerschmitt Bf 110. It was not put into production; just three Me 261s were built and used primarily for testing and development purposes. The Focke-Wulf Fw 56 Stösser was a single-engine, parasol monoplane advanced trainer, built in the 1930s in Germany. Walther Wever was a pre-World War II Luftwaffe Commander. He was an early proponent of the theory of strategic bombing as a means to wage war, while opposing the theories of Giulio Douhet. He died in an air crash in 1936. 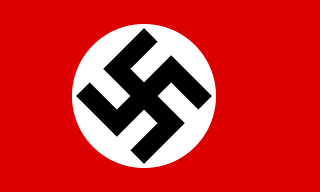 The Defence of the Reich is the name given to the strategic defensive aerial campaign fought by the Luftwaffe over German-occupied Europe and Nazi Germany during World War II. Its aim was to prevent the destruction of German civilians, military and civil industries by the Western Allies. The day and night air battles over Germany during the war involved thousands of aircraft, units and aerial engagements to counter the Allied strategic bombing campaign. The campaign was one of the longest in the history of aerial warfare and with the Battle of the Atlantic and the Allied Blockade of Germany was the longest of the war. 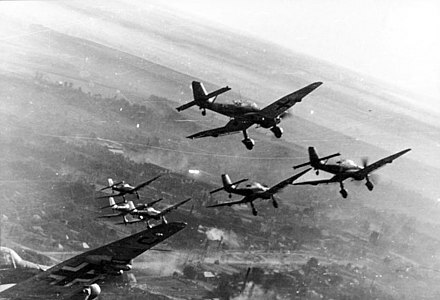 The Luftwaffe fighter force defended the airspace of German-occupied territory against attack, first by RAF Bomber Command and then against the United States Army Air Forces (USAAF). During the Second World War the German Luftwaffe was the main support weapon of the German Army (Heer). It fought and supported the Wehrmacht's war effort throughout the six years of conflict and contributed to much of Nazi Germany's early successes in 1939–1942. After the turn in Germany's fortunes, it continued to support the German ground forces until the German surrender in May 1945. ↑ See Luftwaffe guards at concentration camps for a full list. ↑ Literally "bandit fighting", the word referred to ethnic cleansing and genocide under the guise of anti-partisan warfare. ↑ Tom Philo. "WWII production figures". Taphilo.com. Archived from the original on 26 March 2017. Retrieved 26 April 2014. ↑ Jason Pipes (2008). "Statistics and Numbers". Feldgrau.com. Archived from the original on 26 March 2017. Retrieved 26 April 2014. ↑ Hartmann, Bert. "Luftarchiv.de – Kennzeichen – Allgemein, Abb.4 – Balkenkreuz auf Flügelunterseite und Rumpf". Luftarchiv.de. Archived from the original on 17 November 2015. Retrieved 15 April 2018. ↑ Hartmann, Bert. "Luftarchiv.de – Kennzeichen – Allgemein, Abb.4 – Balkenkreuz auf Flügeloberseite". Luftarchiv.de. Archived from the original on 17 November 2015. Retrieved 15 April 2018. ↑ Hartmann, Bert. "Luftarchiv.de – Kennzeichen – Varianten des Hakenkreuzes, Abb.2". Luftarchiv.de. Archived from the original on 17 November 2015. Retrieved 14 April 2018. ↑ "Entry in German dictionary Duden". Archived from the original on 24 February 2016. Retrieved 16 February 2016. ↑ Griehl & Dressel1998, p. 9. ↑ Dressel & Griehl 1994, p. 176. ↑ Ketley & Rolfe 1996, p. 3. ↑ Ketley & Rolfe 1996, p. 7. ↑ Griehl & Dressel 1998, p. 53. 1 2 3 4 "High Command of the Luftwaffe". feldgrau.com. Archived from the original on 17 June 2017. Retrieved 26 September 2012. ↑ Der Einsatz von Behelfspersonal bei der Flak Archived 21 September 2016 at the Wayback Machine Retrieved Sept. 15, 2016. ↑ Die Deutsche Luftwaffe in der Ostmark Archived 26 April 2017 at the Wayback Machine Retrieved Sept. 15, 2016. ↑ Schramm, Percy E. (21 November 2012). "Die deutschen Verluste im Zweiten Weltkrieg". Die Zeit (in German). Archived from the original on 10 July 2018. Retrieved 1 February 2019. ↑ "World War II: Yanagi Missions – Japan's Underwater Convoys". historynet.com. Historynet.com. 12 June 2006. Archived from the original on 2 April 2015. Retrieved 12 January 2015. ↑ "B-29 Design/Devemopment – Engines". 468thbombgroup.org. Archived from the original on 30 June 2017. Retrieved 1 August 2013. ↑ von Gersdorff, Kyrill; Schubert, Helmut (2007). Die deutsche Luftfahrt: Flugmotoren und Strahltriebwerke (in German). Bonn: Bernard & Graefe Verlag. ISBN 978-3-7637-6128-9. ↑ Fedden, Sir Roy (6 December 1945). "German Piston-Engine Progress". Flight Magazine. London, UK: Flightglobal. p. 603. ↑ Christopher, John. The Race for Hitler's X-Planes (The Mill, Gloucestershire: History Press, 2013), pp.80–81. ↑ Christopher, John. The Race for Hitler's X-Planes. The Mill, Gloucestershire: History Press, 2013. p. 74. ↑ Thomas, Nigel & Caballero Jurado, Carlos (1992). Wehrmacht Auxiliary Forces. Osprey Publishing Company, pp. 4, 13. 1 2 Vajda & Dancey 1998, p. 118. ↑ Uziel 2011, pp. 180, 185. ↑ Buggeln 2014, p. 45. ↑ USHMM 2009, p. 870. ↑ USHMM 2009, p. 958. ↑ USHMM 2009, p. 959. ↑ USHMM 2009, p. 962. 1 2 USHMM 2009, p. 955. ↑ USHMM 2009, p. 396. ↑ USHMM 2009, p. 999. ↑ USHMM 2009, p. 984. ↑ Buggeln 2014, p. 44. ↑ Bauer 1994, pp. 155–156. ↑ Buggeln 2014, pp. 46, 48. 1 2 "Messerschmitt GmbH Regensburg". www.mauthausen-memorial.org. Archived from the original on 28 July 2018. Retrieved 28 July 2018. ↑ Bartrop & Dickerman 2017, p. 427. ↑ "Gusen". www.ushmm.org. United States Holocaust Memorial Museum. Archived from the original on 8 July 2018. Retrieved 28 July 2018. ↑ USHMM 2009, pp. 969, 1012–3. ↑ USHMM 2009, p. 1292. ↑ USHMM 2009, p. 1294. ↑ USHMM 2009, pp. 1426, 1479. ↑ USHMM 2009, p. 352. ↑ USHMM 2009, p. 527. ↑ USHMM 2009, p. 652. ↑ USHMM 2009, p. 702. ↑ USHMM 2009, p. 820. ↑ USHMM 2009, p. 834. ↑ USHMM 2012, p. 1078. ↑ USHMM 2012, p. 1166. ↑ USHMM 2012, p. 1288. ↑ USHMM 2009, p. 336. ↑ USHMM 2009, pp. 820–1. ↑ USHMM 2009, p. 222. ↑ USHMM 2009, p. 291. ↑ USHMM 2009, pp. 1016–7. ↑ Westermann, Edward B. (2016). Hitler's Ostkrieg and the Indian Wars: Comparing Genocide and Conquest. University of Oklahoma Press. ISBN 9780806157122. ↑ Neal, Stephan D. Yada-Mc (2018). Places of Shame – German and Bulgarian war crimes in Greece 1941–1945. BoD – Books on Demand. p. 36. ISBN 9783744850735. ↑ "On This Day June 3, 1941: What Happened to the Cretan Village of Kandanos When its Citizens Defended Their Homes from Invading Nazis? – The Pappas Post". The Pappas Post. 3 June 2018. Archived from the original on 22 August 2018. Retrieved 22 August 2018. ↑ "1. Fallschirmjäger-Division" (in Italian). Atlas of Nazi and Fascist Massacres in Italy. Archived from the original on 21 September 2018. Retrieved 20 September 2018. ↑ "3. Panzer Grenadier Division" (in Italian). Atlas of Nazi and Fascist Massacres in Italy. Archived from the original on 21 September 2018. Retrieved 20 September 2018. ↑ "4. Fallschirm-Jäger-Division" (in Italian). Atlas of Nazi and Fascist Massacres in Italy. Archived from the original on 21 September 2018. Retrieved 20 September 2018. ↑ "III. Gruppe/Luftwaffe-Artillerie-Regiment 19" (in Italian). Atlas of Nazi and Fascist Massacres in Italy. Archived from the original on 21 September 2018. Retrieved 20 September 2018. ↑ "20. Luftwaffe-Feld-Division" (in Italian). Atlas of Nazi and Fascist Massacres in Italy. Archived from the original on 21 September 2018. Retrieved 20 September 2018. ↑ "Fallschirm-Panzer-Division "Hermann Goring"" (in Italian). Atlas of Nazi and Fascist Massacres in Italy. Archived from the original on 21 September 2018. Retrieved 20 September 2018. ↑ USHMM 2012, p. 1550. ↑ USHMM 2012, p. 267. ↑ USHMM 2012, p. 638. ↑ Blood 2010, p. 249. ↑ Blood 2010, p. 251, 266. ↑ Blood 2010, p. 256. ↑ Blood 2010, p. 262. ↑ Blood 2010, p. 258. ↑ Blood 2010, p. 252. 1 2 3 4 USHMM 2009, p. 444. 1 2 Tyson, Peter. 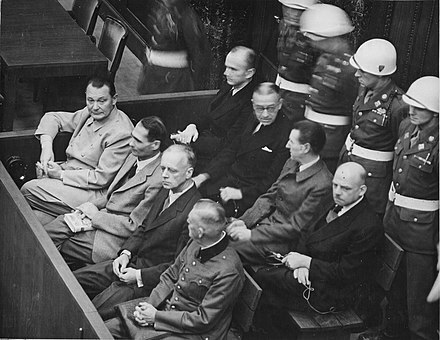 "Holocaust on Trial: The Experiments." Archived 4 September 2017 at the Wayback Machine NOVA Online. Retrieved: 23 March 2008. ↑ USHMM 2009, p. 1005. ↑ Javier Guisández Gómez (30 June 1998). "The Law of Air Warfare". 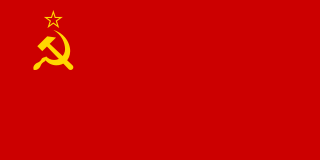 International Review of the Red Cross (323): 347–363. Archived from the original on 25 April 2013. ↑ Terror from the Sky: The Bombing of German Cities in World War II. Berghahn Books. 2010. p. 167. ISBN 978-1-8454-5844-7. 1 2 Davies, Norman (29 August 2009). "We must not forget the real causes of the war". The Independent. Archived from the original on 26 January 2012. Retrieved 25 February 2010. ↑ Słomińska, Sylwia. "Wieluń, 1 września 1939 r" (in Polish). Archived from the original on 5 January 2009. 1 2 Trenkner, Joachim (29 August 2008). "Wieluń, czwarta czterdzieści" [Wieluń, four forty am](PDF) (in Polish). Archived from the original (PDF file, direct download 67.9 KB) on 17 March 2012. ↑ Trenkner, Joachim (1 September 2009). "Ziel vernichtet" [Target destroyed]. Die Zeit (in German). 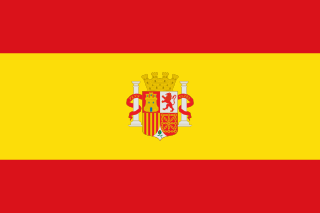 2003 (7). Archived from the original on 8 September 2009. Retrieved 4 June 2010. ↑ Boog, Krebs & Vogel 2006, p. 366. Blood, Philip W. (3 August 2010). "Securing Hitler's Lebensraum: The Luftwaffe and Bialowieza Forest, 1942–1944". Holocaust and Genocide Studies . 24 (2): 247–272. doi:10.1093/hgs/dcq024. Bungay, Stephen. The Most Dangerous Enemy: A History of the Battle of Britain. London: Aurum Press, 2000. ISBN 1-85410-721-6. Dobosiewicz, Stanisław (2000). Mauthausen–Gusen; w obronie życia i ludzkiej godności[Mauthausen–Gusen; in defence of life and human dignity] (in Polish). Warsaw: Bellona. ISBN 978-83-11-09048-4. Drabkin, Artem.The Red Air Force at War: Barbarossa and the Retreat to Moscow: Recollections of Soviet Fighter Pilots on the Eastern Front. Barnsley, South Yorkshire, UK: Pen & Sword Books, 2007. ISBN 978-1-84415-563-7. Obermaier, Ernst (1989). Die Ritterkreuzträger der Luftwaffe Jagdflieger 1939 – 1945[The Knight's Cross Bearers of the Luftwaffe Fighter Force 1941 – 1945] (in German). Mainz, Germany: Verlag Dieter Hoffmann. ISBN 978-3-87341-065-7. Tooze, Adam. The Wages of Destruction: The Making and Breaking of the Nazi Economy . London: Allen Lane, 2006. ISBN 0-7139-9566-1.